Storing one’s valuables in a convenient container somewhere safe and out of the way is fast becoming a global essential, as rentals are skyrocketing, millennials aren’t buying houses, and belongings are left with nowhere to go. However, it is still your responsibility to ensure that your things are safely locked up behind a capable, good lock, and picking the right one can be a challenge if not armed with the right information and know-how. Have a look at LockDownPros‘s top picks for the Best Storage Unit Locks for 2019, and see how easy it can be to keep your stuff safe and secure. The Discus Lock is the king of the storage unit locks, and the Brinks 673-70401 70mm definitely lives up to the title. It is very smart to pick a lock with as little exposed shackle as possible, and this rubber-clad monster has just enough shackle movement to latch onto your average storage unit door with snug ease. These locks come in packs of 4, all keyed alike, so you can access multiple storage units with a single key, which means fussing around with a chain packed with keys is a thing of the past. The fact that the shackle of this lock is Boron Steel is an intelligent afterthought, as even if a thief did miraculously manage to access it amidst the strong shroud of stainless steel and rubber, they would have a near impossible time breaking through it. All Your Storage Unit Lock Questions Answered! The best storage unit locks on the market are those that can be trusted to guard your valuables vigilantly without fail, consistently preventing theft and vandalism. What is, as always, incredibly important when choosing any lock is to select the appropriate shape and design for your specific needs. With storage units, latches can range in size, so it is important to measure the space you have available to use before buying a storage unit lock. At the end of the day, it all comes down to the performance of the padlock when put under immense stress. A downside of a long shackle padlock like the Weatherproof Long Shackle Laminated Padlock is that because of its “U” shape, there is far more of the hasp exposed to the elements, and thus is easier to be tampered with by intruders. 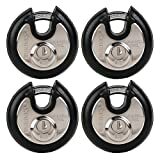 The Disc shaped padlock, like the Brinks 673-70401, is the most popular choice for storage unit locks hands down, because its round-shaped body shrouds the majority of the shackle, protecting it from attempts at cutting, grinding or high impact blows. Just make sure you have enough space on your storage unit latch to fit one of these hefty boys. It is also vital to consider where your storage unit is situated: if your belongings are being stored in an outside storage block, choosing something weather resistant is paramount, so as not to have the locking mechanism succumb to corrosion over time and become sticky or even stuck. A good lock for surviving the elements would be either the Brinks 673-70401 Discus Lock, which has a weather resistant stainless-steel body with a full rubber jacket to combat moisture damage or the Weatherproof Long Shackle Laminated Padlock that has been fitted with a polymer lock cover to fully protect the locking mechanism within. Using a combination lock to secure a storage unit is not the best of ideas, as they are generally less robust in design and manufacture than Discus or Shrouded Keyed locks. Combination locks on the cheaper side are often made for school and gym lockers, but should not be used flippantly to protect things of significant value. What Kind Of Storage Unit Locks Fit A Shurgard Unit? Some of the best storage unit locks will actually come recommended by the storage facility itself. One company, Shurgard, has taken up the growing trend of installing cylinder locks on each of their storage unit doors. Cylinder locks are very similar to the lock mechanisms we install in our doors all over the world – they are very hard to tamper with, as most of the lock is permanently fixed to and embedded in the door. You can still make use of a padlock over and above this, however, as Shurgard’s cylinder locks and fixtures come with a latch that can be secured from the outside too, offering double the protection. 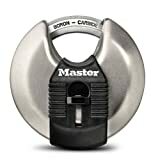 MASTERLOCK M40XKADCCSEN 70mm Disc Padlock, 2-3/4"
Master Lock is a household name in padlock technology, and their 70mm Discus lock sports many of the great features that consumers have come to expect and appreciate from this undeniably good lock brand. Similarly, to the Brinks 70mm Discus Padlock review above, the body is made from hardy, weather-resistant stainless steel, and hides the nearly all the shackle within its tough outer shell. The shackle itself is made of high-quality hardened steel, and will hold up to massive amounts of abuse, should you be unlucky enough to ever have to see it do its job. It also has a 4-pin cylinder within the lock mechanism that has been carefully designed to withstand lock-picking. There has been an increase in the use of cylinder locks to secure storage units over the last few years, and Shurgard is only one of a broad spectrum of storage facilities that accommodate their installation. 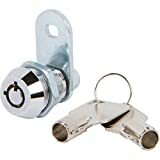 Because cylinder locks cannot be fixed to just any door, it is paramount to do research on the kind door your unit has, and only then decide what lock to use. The Products Quad 25mm 7/8 Cylinder locks come in packs of 2, are keyed alike and have a stainless-steel finish. Although very secure and difficult to dislodge or remove, the lock can still be picked by learned fingers and must be fully removed upon leaving the unit, which can be time-consuming and more of a hassle than simply clipping off your padlock. The best way to make use of cylinder locks like this is to have it installed, and then use a high-quality Discus lock like Master Lock or Brinks 70mm thereover. Weather resistance is absolutely top priority when shopping for a lock or padlock to secure outside storage units. The SE Weatherproof Long Shackle Laminated Padlock is kitted out with a plastic stopper to protect the delicate locking mechanism within and has a laminate that covers its brass body that combats the corrosive power of the elements. The long shackle is more forgiving of larger latches – at least more so than the Discus design, but this, unfortunately, comes at the cost of lower security. The shackle is the most vulnerable part of the lock, so having a lot of it exposed to attack is less than advisable. It is more cost-effective than some of the other locks reviewed above, but in this case, it really is a “you get what you pay for” situation. Theft is an unfortunate reality of our time, but it does not need to dictate and restrict the way we love our lives. By choosing top quality storage unit locks that are designed specifically with the safety of your stored valuables and particular unit parameters in mind, you can rest assured that, unless a tornado or an earthquake should occur, your unit will remain secure, and your things safe and snugly within.